32Red Bingo - £10 Free bingo no deposit required! 32 Red Bingo is part of the prestigious 32 Red Group PLC, which also includes casino, poker and sports book. 32 Red is listed on the London Stock Exchange, which is an excellent accolade for any online gaming company. 32 Red operates on cutting-edge Microgaming software – this is no download bingo at its best. You can play 90 ball, 75 ball bingo with plenty of rooms to play in. There is also online slots, video poker and classic casino games such as roulette and blackjack in a slick and sophistictaed environment. 32Red operates on a cutting-edge Microgaming software - this is no download bingo at its best. Funding your account can be done with the following payment methods: Visa, Mastercard and Paypal. Log in and head to credit your account. 32Red carries an eCogra certificate, this is a seal of approval awarded to bingo halls which have achieved compliance with eCogra's high standards and demonstarted that: games are fair, the bingo hall operates honestly and behaves responsibly plus monetary deposits are safe. 32Red has a lovely funfair style landing page with plenty on offer to tempt you to join. Signing up is quick and easy, and once you have whizzed through the registration process, you will find a £10 no deposit bonus in your account within 15 minutes of adding your card details. Make a deposit of £10 and get £32 free, and take advantage of a 25 percent bonus with every reload. The Microgaming software is much-loved and very popular all over the bingo industry, with tickets starting from just 5p and plenty of free games too. The lobby has a countdown timer displaying when each game is due to start, the amount of players in each room, and ticket price. From the lobby, you can also launch table games, fruit machines and online scratchcards. The game interface is bright, colourful, and intuitive and it's easy to keep an eye on which balls have been drawn. 32Red is licensed and based in Gibraltar. 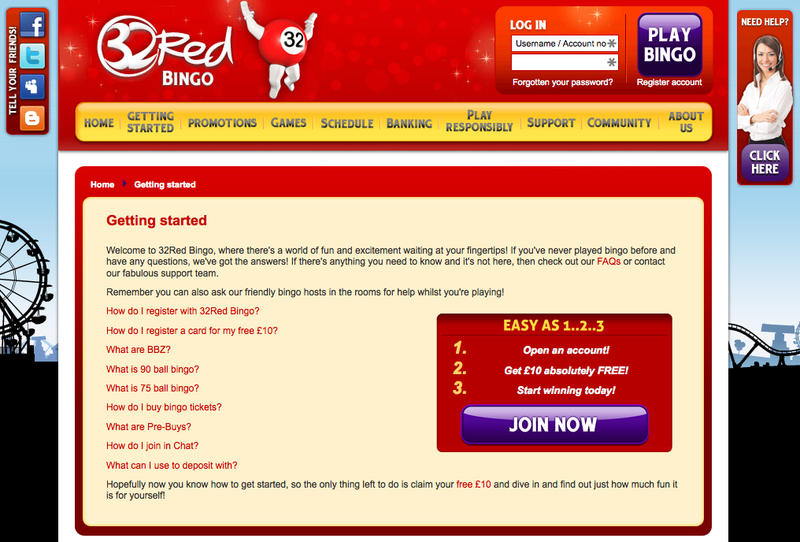 32 Red Bingo is a pretty site, it is well put together and has a real sense of underlying fun. The site is easy to navigate, and everything you need is easily accessible from the homepage. 90 ball bingo is the only option here, which is limiting, but as the most popular bingo game on the planet, they have at least taken the right one game. For slots fans, there is a good choice here for you too, and if you are split between the two in terms of preference, then there are bingo slots to keep you happy. Casino fans can find video poker games, as well as keno, poker, blackjack, and roulette, meaning that although there is limited choice, there is something to suit most tastes. The games selection is the only thing that lets 32 Red Bingo down a bit, the site looks amazing, has excellent promotions, with a bit wider variety of games, it might well be perfect.